One School One Planet (OSOP) is a project with a global vision. Climate change is a global phenomenon, and our central theme is that the mainstream school curriculum needs to change. We are failing to prepare pupils for what is coming. If the Paris Climate Agreement is anything to go by (it turns out to be the very least we have to do), then everything must change rapidly in light of the unanimous scientific advance that we are indeed entering a climate emergency. This short post outlines the background and context for Sector39’s work in Wales and Uganda. Planting fruit tree guilds with Llanfyllin High School students. Llanfyllin High School is our key partner in working out how we might go about bringing about the kind of educational shift that we need. Another important link in Llanfyllin is Dolen Ffermio, a local charity of 20 years standing, who had already established a relationship with the High School some years ago, well before I was involved with them. They have been sending student groups and teachers from Llanfyllin out to Uganda to enable them to gain a global perspective and to develop themselves personally. 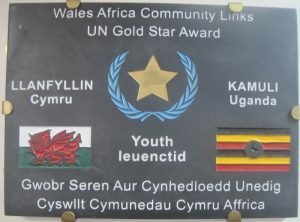 Plaque in the Reception at Llanfyllin High School, recognising the school’s international links. As part of the OSOP vision we paved the way for Nina Duckers (20) and Grace Maycock (26), both of whom are former Llanfyllin High School students), to move out to Uganda where they were embedded in Sabina School, Rakai as permaculture partners. Ambassadors from one bio-region to another. 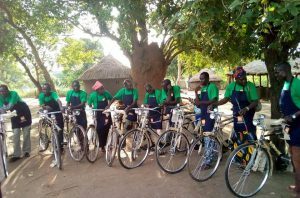 They were supported by a Ugandan permaculture network organisation – the Permaculture Research Institute of Uganda – and a Ugandan training partnership called Broadfield Enterprises. 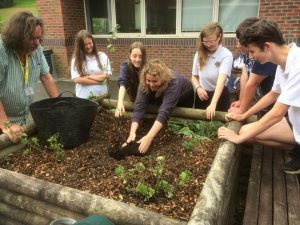 Grace and Nina were latterly joined by Han Rees (35), another past Llanfyllin High School student, were installed at Sabina School to lead on horticulture projects, and to link their work to the curricular activities of the school. While working on all of this Nina also served as our social media co-ordinator, and was given a brief to capture as much of what happened whilst they were there in photographs and videos. In May 2018 we sent out a team of engineers, from Machynlleth and Llanfyllin, Steve Jagger, Dan Grove and Richard Stephenson, who also based themselves at Sabina School. While at the school they designed a series of practical activities related to permaculture, carbon reduction and climate resilience. They made bee hives, composting toilets, charcoal briquettes from market waste, water filters and more. This was all done voluntarily and in such a way as to complement and reinforce the horticultural work. Nina, Han, Richard and Grace. At the end of May, and into June, I came out to the school to see how the work was progressing, and to run some educational activities at the school. This was invaluable time for the development of permaculture teaching resources, which could be put to use back in Wales. Later in June I was invited by the Norwegian Refugee Council (NRC) to travel to Northern Uganda to put together a training programme for refugees. Han Rees, Grace and a team of Ugandans supported us to replicate the work of Dan, Steve and Richard with refugees. The training up of Ugandan permaculture teachers was supported by the educational work myself, Jack and Nina had created in both Wales and Uganda. From this initial burst of activity we have gone on to win a six month contract to carry on with this work on until December 2018. Sector39 trained permaculture team, on the ground in refugee camps in the North of Uganda. The groundwork is being delivered by our African partners, and I have agreed to oversee this to make sure it goes ahead as planned. In essence we are training a Ugandan team to deliver the content created by the One School One Planet project. It is our hope in writing this that we have illustrated how Sector39’s various projects link together, how we are linking our work with the school to global climate responses, and how we are developing curricular content in both Wales and Uganda that reflects and communicates this work.